Square Enix CEO claims that a remake right now would cast a death sentence on the series. 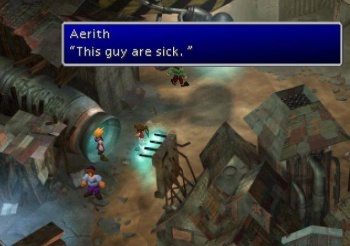 Less than a week after a leaked website hinted at a PC remake of Final Fantasy VII, Square Enix CEO Yoichi Wada has declared that a remake right now would most likely kill off the franchise. The denial - the latest in a long line - comes with an admission that recent titles in the series just haven't been of the same quality. When asked the inevitable question about a possible FF7 remake at a Q&A session as part of Square Enix's annual shareholders' briefing, Wada expressed a desire to create a new Final Fantasy game that surpasses VII before retreading old ground. He went on to say that although the team would be happy to work on a remake, it would have to be taken seriously, as the title is "revered as a 'divine game'". This echoes the sentiment of lead character designer Tetsuya Nomura, who last month acknowledged fans' appetite for a remake, whilst saying that new titles would have to take precedence over such a project. Wada's remarks fortify the company's official line of "no comment" on the recent leak, which saw a site registered to the company suggesting the existence of an enhanced PC rerelease. A similar leak from Steam this time last year hasn't yet turned up an actual release, and it could well turn out that this will also come to nothing. Whatever the case is, though, it's clear that for now those waiting on an official announcement of a remake will have to wait a little while longer.